J.M. 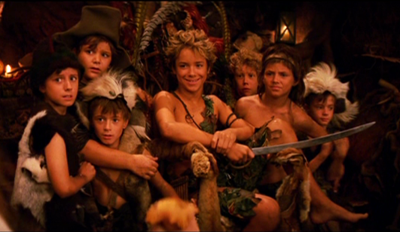 Barrie's Peter Pan and all its characters are in open domain in most parts of teh world. The Walt Disney Company holds some copyrights to their own visions. The background texture is offered by GRsites.com. I don't own the images I use in the graphics, but they belong to all their rightful onwers. I don't own The Walt Disney Company's visions but they belong to The Walt Disney Company. This is a non-profit fan site for entertainment and educational purposes only. No copyright infringement intended. Copyright Disclaimer Under Section 107 of the Copyright Act 1976, allowance is made for "fair use". Fair use is a use permitted by copyright statute that might otherwise be infringing. Non-profit, educational or personal use tips the balance in favor of fair use.